Week-long vacations are nice, but those short one-day excursions or weekend trips can be just as great if you’re planning it on Long Island! Whether you’re looking to fill in the regular weekday, weekend, extended holiday weekend, or summer day (when the kids are out of school) with interesting places to go and activities to do, there’s no shortage of options on Long Island. From the west end to the eastern tip of Long Island, families can enjoy walks around town, parks & landmarks, fun attractions and museums. There’s something to suit everyone’s interest. Make a visit to some of these hotspots for a day trip destination on Long Island! From admiring the old homes and architecture of buildings to checking out the little shops, restaurants and parks, here are a few towns on Long Island worth a visit. This small village town dates back to the 1600s. It was once an active whaling port. A visit to the Cold Spring Harbor Whaling Museum will help you learn about the history of whaling through artifacts like a 19th century whaleboat. Also in town and worth a visit is the Fish Hatchery & Aquarium where you can learn about the freshwater ecosystem of New York and see living collections of freshwater organisms. This barrier island sitting at the South Shore is a popular destination with its breath-taking shorefront view. There’s also plenty to do like a visit to the Fire Island National Seashore, the Fire Island Lighthouse, boating, kayaking, fishing, camping and other things to put you in touch with nature. Sitting between East Hampton and South Hampton is this charming little town. It features nautical attractions, shops, restaurants and theatre and cinema, including the Bay Street Theatre where live shows are available year round. You can also find peace taking a stroll around Trout Pond and Marine Park. If you and the kids need a sweet treat, head over to Big Olaf on Wharf St. for a taste of their homemade ice cream. Head to the North Fork of Long Island and enjoy all that this family-friendly town has to offer, including a beautiful antique carousel, an ice skating rink, and Greenport's own skate park. One can also expand their minds at Greenport's great museums, like the Railroad Museum or the Blacksmith Shop. Since the town is on the water, make sure you take in the seaside activities and take a charter boat or a cruise around the lighthouse! From state landmarks to national landmarks, Long Island is home to quite a few of them. 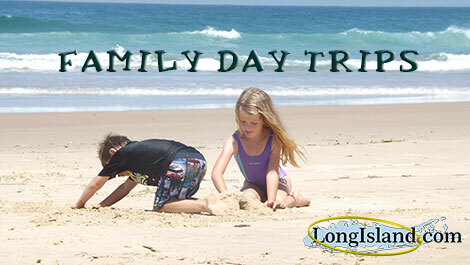 There are also plenty of beaches and parks for the family traveler. Take a steep climb up this 168-feet tall lighthouse tower for a view atop Long Island’s tallest lighthouse. Get a view of the Atlantic Ocean from the easternmost point on Long Island through this lighthouse tower standing 110 feet high. This was the first lighthouse built in New York and it is one of the oldest lighthouses to remain in the country. Make a visit to one of Long Island’s best-preserved estates. Old Westbury Gardens is on the National Register of Historic Places and offers 200 acres of beautiful landscape complete with gardens, woodlands, ponds and lakes. The Westbury House also sits here where you can see fine English antiques and decorative art. This state historic park is the former Gold Coast estate of the W.R. Coe family. Those who enjoy gardens, woodlands, and nature trails will find interest here. Home to our 26th President, Theodore Roosevelt, Sagamore Hill is where his home and summer house reside. The location is now a national historic site where the public can explore his the legacy as one of America’s most popular presidents and the surrounding area complete with peaceful paths and nature trails. Many may know of the Walt Whitman Mall on Long Island, but how about the man himself? Make a visit to one of America’s finest poets’ birthplace and take a tour of his childhood home. Whether you have toddlers in tow or teenagers, a great amusement attraction park can be fun for the entire family from its rides, arcade games to challenging courses. From water rides to rollercoasters and arcade games, enjoy hours of fun with the family at this amusement park! Those who are on a budget will also appreciate that there’s no admission fee, simply enter the park and pay only for the rides and activities you want to take part in. Unlimited riding bracelets are also available. For the outdoor thrill seeker, have a try at zip lining and an aerial ropes challenge course. This place also has self-guided trails. The trails are designed with different challenges, including ones suitable for children as young as age 7. No matter the season, adventure is what you’ll get at this location. Depending on the season you’re visiting, you can find enjoyment from a game of miniature golf, bumper boats, rock climbing, rope courses, ice skating, a lights show, train ride, haunted houses and much more! Museums and exhibits aren’t just to learn, but to have fun while doing it! Many on Long Island feature interactive hands-on experiences for people of all ages to enjoy. Take a look into the history of whaling in the Long Island region. The Museum is complete with artifacts, including a 19th century whaleboat. The exhibits here are like taking a trip to go under the sea. It features an 120,000-gallon shark tank, penguin encounters, tropical fish from around the world and so much more! There’s a reason it’s called Museum Row. This place is essentially the home to several popular museums sitting practically next to one another in a row. Here, you can find the Cradle of Aviation Museum, the Long Island Children’s Museum, and the Nassau County Firefighters Museum and Education Center. This is also home to The Long Island Museum for Science and Technology, which is currently under development and will be connected to the Cradle of Aviation Museum. After a fun day of museum hopping, catch a ride on Nunley’s Carousel adjacent to the Cradle of Aviation. The carousel was created in 1912 and has been restored to its former glory. Take a step back into the 19th century with a look at how the typical rural Long Island farm village looked. Roam through 200 acres of land complete with historic buildings, a school, farmhouse and general store. Learn about the ancestors and living history of Native Americans – it looks at the Algonquin descendants. This is the only Native American operated museum on Long Island. Get up close and see the workings of a real farm. Pet some farm animals, make crafts, take a wagon ride, learn how fruits and vegetables are grown at the Children’s Garden and so much more! Don’t see your favorite day trip destination listed? Let us know!